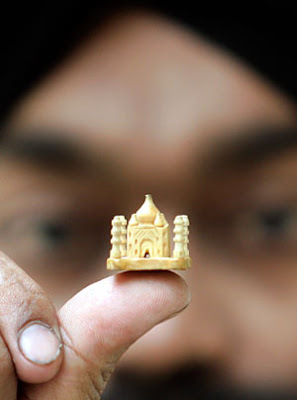 Indian miniature artist Jaspal Singh Kalsi, above, displays his creation of 1.5 cm high (0.59 inch) wooden replica of the Taj Mahal, in Amritsar, India in 2007. The Taj Mahal was among the leading contenders to be the new Seven Wonders of the World. 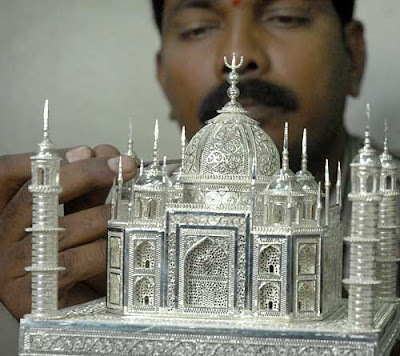 Finishing touches to a silver replica of the Taj Mahal, above, are made in Hyderabad, India in 2007. It was created and displayed in the city to garner public vote for the building to enter the new Seven Wonders of the World competition.